I started gambling when I was a small boy, when I was no older than 8 years old. I would make wagers with my older brother for chores around the house. We would place bets on the outcome of sports and video games. I lost most of the time, which made me want to bet even more. I soon felt the exhilaration and excitement of the games increase as the size of the bet was increased. I was hooked very young. I made my first trip to a casino in Laughlin, Nevada, when I was 18. I was on my way to Marine Corps boot camp, and my mom and I went to have some fun. It was exciting to walk into the casino. The first thing I noticed was the sound of the slot machines, then the smell of cigarettes and stale beer hit me and the music of clicking chips as people nervously shuffled them in their hands. I was in love, I had found a home. My first bet in a casino was on a nickel slot machine. That was not enough action or risk for my blood and I headed for the blackjack table. I think I lost a grand total of $40 my first trip. The feeling I had in that casino is one that will haunt me for a long time, I had the itch and wanted more. It was not an obsession not yet. My life was far from normal. I was a ferocious drinker and in trouble often while in the Marines. I was discharged from the Marine Corps honorably for a medical condition after serving 2 years as a presidential guard for Presidents Reagan and Bush. I landed a job making okay money, and the calling of Vegas was stronger than ever; I had to get back. I made my first trip within 2 months of being discharged from the Marine Corps. I was soon married, and my wife and I made a trip to Vegas every few months for the first 2 years of our marriage. The trips to Vegas were not enough to quench my appetite for action; I had to have more. Soon I was betting on darts, golf, and everything in between. Of course I was making small wagers with my friends, but the excitement was enough to make even a boring game a matter of life and death. 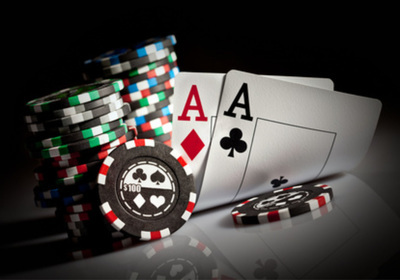 As a salesman on the road, it was not long until I found the card clubs in Los Angeles, and I began playing poker. I started out in the small games, playing $1-2, 7 card stud. I was not very successful but never wagered more than $20-$60 at a time. It was manageable, but it was something I hid from my wife. Thus began the excitement of a secret life and playing for small amounts held higher stakes than winning or losing. I had to win or risk being found out. I began to run into trouble with my drinking and was distracted from playing for a while maybe a year or so. When I decided to stop drinking and start playing cards, things went from bad to worse. I would play between 2-4 times a week, depending on my schedule and how much time I could get away from the house. My wife and I owned a dance studio with her parents. She would work until 9 or 10 at night. I would get home from work around 5, and she would be at work. It was plenty of time for me to make the 45-minute drive to the casino and wager my usual $40 in a small stud game. The games were crazy for me to play because I had a time limit of a few hours and had to force my hands; if I lost, I risked being found out. I soon began to chase losses and would borrow money from friends and family to cover my bets. It was never much money -- a few hundred here, fifty there. I was good about paying the money back; so not many questions were asked. My life was beginning to become a lie. I was playing more and more. Then it happened; I won my first jackpot. It was not much -- close to a thousand dollars but no one knew I had won the money. Now I could play undetected and move to bigger games. I lost that thousand in a day. I chased that thousand with 3 thousand, and I lost. Now the trouble started because that was my rent money and I had to tell my wife what happened. As I look back at the time in my gambling career, I see how much time I wasted. It was not just the time at the tables, it was the time chasing the lies, all the energy I spent remembering what lie I told and to whom. All the energy wasted on trying to figure out how I could get more cash so I could get back into action. I can remember the day Magic Johnson announced he had HIV I was sitting at a 4-8 stud game. I was 23 years old. Gambling for me was something I had to do, and I had already spent close to $10,000 doing it. I had to find new friends because the people I grew up with were sick and tired of watching me get crushed at the casinos. The hardest part was the horror of leaving a casino after losing money I did not have. It was to the point were I was considering suicide. Of course, all of my troubles were because of a bad marriage. No way was I sick or to blame. I had never even heard of Gamblers Anonymous. My marriage ended badly. It ended because she was married to a compulsive gambler who would tell a lie if the truth suited him better. I moved out to live with a friend. Of course, the first trip we took was to Vegas. To finance that trip I sold my car that I did not own. The bank made a mistake and sent me the pink slip. I sold it for $950. I lost a lot of money I did not have that trip and spent a long time paying people back. I stopped gambling for a long while and consumed myself with a heavy dose of cocaine, beer, pot and ecstasy. I snapped out of that after 14 months. I was tired of not having money and just dreaming about it. I was fueled by a desire to be a big shot with lots of money and power. I found just the job to do it in. Coming off a long run of drugs, I had enough energy to become successful quickly. Not only was I clean, I was back and soon found myself married to an intelligent, wonderful woman. I was promoted several times rapidly and began to make serious money, in the 6 figure range. Now I could go to Vegas and be the big shot I always wanted to be. Oddly enough, I did not go that often, maybe 4 times in the first year. The second year I went 8 times. Then it happened; I crossed the invisible line of compulsion, and it became an obsession. I had to go to Vegas. I soon was going every chance I had not to mention the high stake poker games I would get into with my friends. It would not be uncommon to win or lose several thousand dollars in a night. I was full steam ahead with my compulsion, and so was my career, I was making more money than I ever had and had gotten into to some favorable stock positions. I had a chance of a lifetime present itself to me. I left my career of 4 years and went to work for an Internet company. I received stock options and soon became a day trader, augmenting that action with my gambling. I was wagering money 12 hours a day. I forced an idea and created an opportunity to move to Las Vegas and open a wireless Internet company. My wife, who was pregnant at the time with our child, did not want to go. The fights were nasty, and I was to blame. I wanted Vegas more than her and more than my unborn child. I had to be in the action. Finally, I got my way; she agreed to move to Las Vegas. I had close to 1 million dollars in stocks and cash when I went out ahead of my wife to scout around for a place to live. One of the first weeks I was in Vegas I was staying at the Hilton and won close to 10,000 playing blackjack. I had started with $300. I knew I was going to take Vegas apart. I was living my dream, stayed at different hotels on the strip, living in suites working during the day and gambling all night long. I would wager between 5 and 15 thousand a week, playing craps, blackjack, and 3-card poker. It was an incredible feeling to walk into a casino and have people know my name. I enjoyed the VIP treatment and could not stop. My wife and I started fighting about my gambling long before she moved to Vegas to join me. She knew I was in trouble with my gambling but had no way of knowing how much money I was actually losing. I would lie to her, and she believed me. Before she moved to Vegas, I swore off gambling forever. It was not long before I was back at it again, playing as hard as ever and betting more and more. I checked myself into an out-patient program for compulsive gamblers. I went 5 days a week 3 hours a day. That lasted for a month. I was back placing bets within 1 week of leaving that program. I would go to a Gamblers Anonymous meeting, then to a casino. I was spending cash at an incredible rate.By this point my daughter was born, and I was a poppa. I swore gambling off again and knew I was in trouble. My obsession to play was stronger than any promise I made to my wife, daughter, or god. I had to be in action at any cost. I would send my wife back to California so I could play. She had control of the bank accounts, the ones she knew about. I was in action full time and playing in the casinos between 4 and 8 hours a day. It was costing more than money; I was losing precious time with my new daughter and wife. I would tell her I was going to the store and stop at the casino and place a few thousand dollars in bets within 30 minutes to an hour. It finally became a problem so immense that I agreed to leave Las Vegas. I had squandered my entire fortune at this point except for maybe a hundred thousand dollars. I took a job in Los Angeles. We sold our house in Vegas and moved in with her father, to save money. I promised to attend GA meetings and never to gamble again. I did attend meeting for the first 2 months. The obsession to play was so great that it consumed me. I was back at my old company and had the autonomy to be gone all day. I was good at my job and was able to perform well with only a few hours a day of effort, that left me 8 hours a day. I started gambling again. Within 3 months I was back playing poker. This time my level of excitement was raised that I had to play in the big games. I started playing Texas Holdum and was playing $20-40 up to $40-80 games. I blew through the rest of my money; I was broke within 18 months. I had spent close to a million dollars in a casino on or in the stock market. All of it was gone. My home life had deteriorated to the point of a constant fight. She did not believe a word I said, and was right not to. I could not even believe myself at that point. I did not want my daughter to be exposed to the ugly fights and I wanted to gamble when I wanted without my wife bothering me. I left my wife and daughter so I could gamble more. I spent the rest of everything I owned, I hawked art, my wedding ring, my watch, anything I had of value I either sold or hawked to play. I had gone into business with a friend and was borrowing money from my company faster than I could pay it back. I was at my wits’ end. The final straw came when I got an eviction notice for my apartment. I knew I was going to die if I kept up at this pace. The amounts of drugs I had to ingest just to look at myself in the morning were alarming. I went to GA and surrendered. I had nothing left; my lease was up at my apartment. I had no way to pay rent I was going to be homeless. A friend I made in GA took me into his house. There was 1 condition: I could stay rent free as long as I did not place a bet. I went to work for my family and was working a program in GA. I made 103 days without placing a bet. I thought I had it licked; little did I know. I started gambling on what would have been my 104th day of abstinence. I had done things I never thought I would do to play cards. I wrote several thousand dollars in bad checks, I stole money from my family, my company, and my friends to play. I went on a 1-week bender that cost me over $10,000 I did not have. I lost my place to stay and was suicidal. My friends and family had enough. I did not know what I was going to do. I checked myself into a rehab. I started working a program in the 12 steps of recovery. I was crazy. I met Robert Miller while I was in recovery. The result of the FS treatment is astonishing. I have no desire to gamble whatsoever. It has been lifted completely. I attend GA meeting regularly. The distinction for me is the fact that I do not have the compulsive desire to gamble. The thought to gamble has traveled through my mind without being a thought that I have to act on. I am able to let it pass through, where before I would have to act on that thought or call someone in the program to help me through that situation. My thoughts of gambling do not have the energy they had prior to utilizing FS treatment.